Juhl, a loft-style community known for its flexible, one-of-a-kind floor plans and industrial chic design aesthetic, introduces two additional models, completing Juhl’s four-model collection and expanding its unique offerings to homebuyers seeking an urban lifestyle in the heart of downtown Las Vegas. The first new model is a contemporary, studio-style, one-bedroom residence, stylishly designed with an open concept floor plan and spanning 713 square feet. 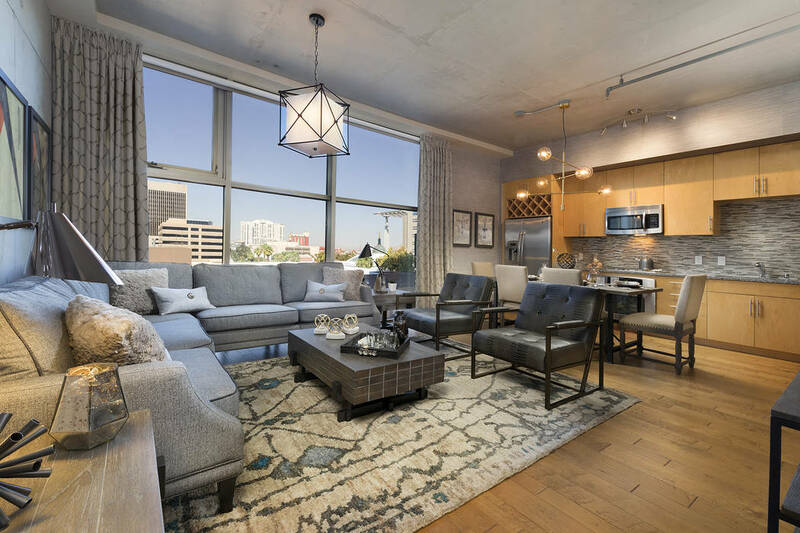 Starting at $219,000, it offers floor-to-ceiling windows, maximizing natural light and classic Vegas views found only in downtown. The second new glam-inspired model is 1,187 square feet and offers two bedrooms, two baths and a private balcony. It is priced from $360,900. The Atlanta-based Lee Bryan Interior Design firm recently designed Juhl’s model residences and shared spaces, including decor featured in the community’s resort-style pool, movie theater and The Canvas Grill. Bryan used his creative vision to furnish Juhl’s lobby, from the modern light fixtures to the eye-catching concierge desk. With considerable experience in creating and enhancing luxury high-rise environments, Bryan used cutting-edge materials to create bright, comfortable living and entertaining areas unique to each floor plan. Recently reimagined, Juhl boasts an upgraded resort-style pool with cabanas, lobby and co-op working spaces that cater to its professional residents. Hallmarks of Juhl include flexible floor plans, large terraces and floor-to-ceiling windows that maximize natural light. Private balconies, 10-foot ceilings, energy-efficient design and details, exposed concrete surfaces and mechanicals and upgraded fixtures and surfaces combine to create Juhl’s cool, urban vibe. Juhl is a popular residential choice for professionals and entrepreneurs, especially many who work at firms and courthouses throughout downtown’s expansive legal community. Juhl encompasses multiple buildings, including a high-rise, mid-rise, brownstones, live/work spaces, retail spaces and a warehouse-style loft building. Many of its residences can be personalized via 130 unique floor plan configurations, including several that are one-of-a-kind within the community. Homes at Juhl range from 600 to just under 2,000 square feet and are priced from the high $100,000s. Amenities include an al fresco movie theater; two-story fitness center with pool and Strip views; 10th-floor wine deck with Strip views; resort-style pool with cabanas, spa and fire pit; 24-hour security; gated parking structure with assigned resident parking; and full-service concierge. A summer kitchen, called Canvas Grill, is the perfect spot for warm-weather entertaining. And a nearby urban garden plot exclusively for use by Juhl residents makes it possible to grow fresh herbs and vegetables in the heart of the city. On the ground level of the community is 20,000 square feet of specially curated retail space that enriches the neighborhood’s existing retail offerings and connects downtown districts, including the Arts District, which significantly inspired the Juhl’s development and design. Now open at The Promenade at Juhl are Greens &Proteins, a modern, family-friendly cafe with a healthy twist; Le Pho, a popular Vietnamese kitchen; Classic Jewel, a cocktail lounge; A/V Boutique, specializing in home theater retail and design; Downtown Decor, offering eclectic and esoteric home furnishings and decor; JAECI, offering inspirational jewelry; Galerie Miscre8, an urban gallery; Get a Haircut, a classic rock-themed barber shop; and the newest addition, The Corner Market. Coming soon is Cultivate Community, a nonprofit organization that originally began as a mural arts program to sponsor large public murals in downtown Las Vegas and the Arts District. For more information, visit juhllv.com or call 702-816-5466. Juhl is at 353 E Bonneville Ave.